There is an perception common to residents of large cities that crime is rampant. Our area has an undeservedly bad reputation for crime. Here in Weston / Mount Dennis, many people react to reports of crime by moving away, staying home more often or avoiding areas concerned. We live next to a country that does indeed have high levels of crime. Not only that but our favourite TV shows are largely American and reflect the culture of crime that exists down there. In addition, the old adage, if it bleeds it leads governs many news outlets and so violent crime often receives the bulk of attention by the media. This gives people a perception that crime levels are roughly comparable to those of our neighbour to the south. Generally speaking, murder is a good indicator of overall crime levels. It’s a terrible and devastating crime; seemingly unavoidable in large cities. Last year, in Chicago, a city slightly smaller than Toronto, a total of 490 people were murdered. Compare that to the 604 murdered in all of Canada in 2015 and suddenly some perspective comes into play. That same year, 55 people were murdered in Toronto, which for a city of this size, is remarkably a rare and shocking event. Toronto by many measures, is one of the safest cities in North America, yes, even compared to the rest of Canada or for that matter, Ontario it’s safe. 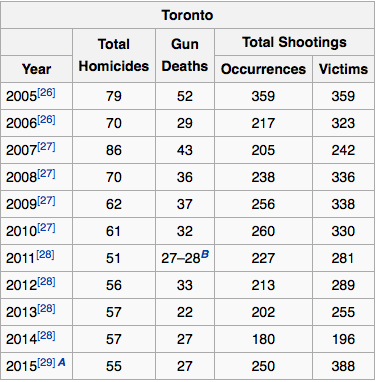 Not only that, looking at figures from ten years ago when 79 people were murdered in the city, Toronto is safer than ever. 2014 figures. From immigroup.com. Click to enlarge. Looking at the raw numbers without sensational headlines, it’s possible to see a downward trend although shooting occurrences remain stubbornly high. Toronto homicides by year. From Wikipedia. Anyone involved in statistics knows that numbers change year over year. Trends establish themselves, anomalies, (better known as blips) can occur too. When police forces and news outlets (as they have this year) proclaim things like “gun homicides are up 200%“, it’s often a short-term blip rather than a long-term trend. It does get peoples’ attention though which is the whole point if you’re trying to maintain a police budget or gather online clicks. 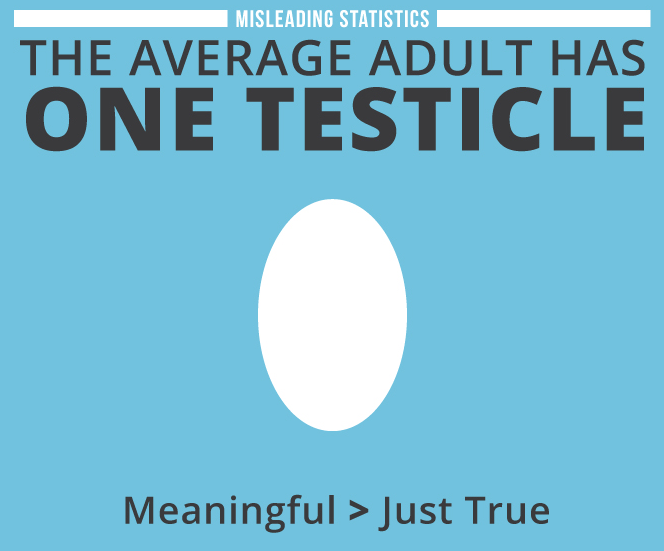 As the old saying goes, there are lies, damned lies and then there are statistics. 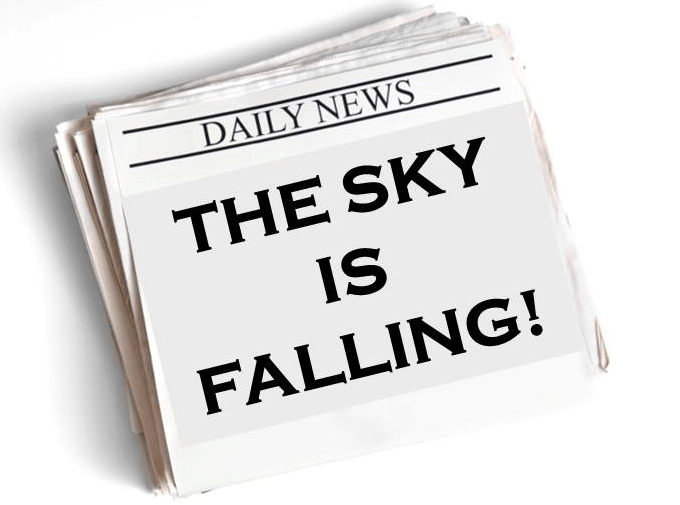 Next time alarming crime statistics are presented in the media or by government agencies, be sure to consider the sources and their motivations before being frightened into thinking that we live in a dangerous city or community. The Humber River Regional Hospital at Church and Jane is not known for its acumen, but this may set a new record for mush-headed moronicity. The hospital forgot to tell the cops that they were releasing an honest-to-god maniac whom the police had just brought in for assaulting one of their own. Courtney Carter spat infected blood at an officer, tried to grab the officer’s gun, threatened his neighbours with a knife, and was charged with assault, threatening death, assaulting a police officer, and disarming a police officer. He was brought to the Church Street campus of the HRRH sometime after midnight, according to The Star. The hospital released him, presumably with a brown bag full of cookies and a hug, without notifying the cops—even though he was, obviously, under arrest. 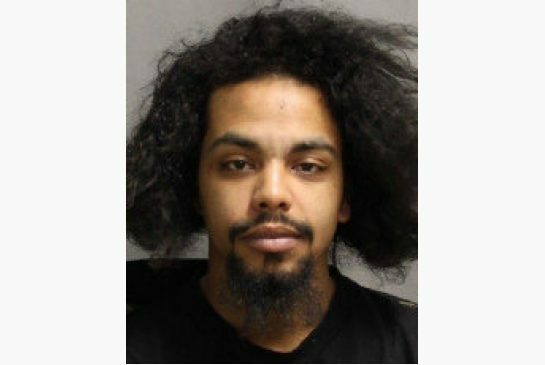 Happily, Carter is not from the Weston area; he was arrested near Black Creek Drive and Weston Road. The police describe him, in their neutral tones, as “extremely dangerous”. He is 5′ 8″, 141 pounds, with many tattoos and a frizzy afro. He should not, obviously, be approached. Police have released the name of the boy murdered in Weston last weekend. He was *****, 16, from Etobicoke. *****’s Facebook page is both frightening and sad. The background is hands spelling out “Crips” over a blue bandana, the colours of the gang. ***** also posted a picture of himself throwing a gang sign. One of his friends commented on the pictures a year ago, saying “your tryna die fam”. Another said “You trying to kill your self your fucked”. *****’s responses are proud but insensible: “its a crip ting” and “fly crippinggg”. A Crips gang does—at least according to the internet—exist in the Scarlett Road area of Etobicoke where ***** lived. ***** may have been killed as part of a gang dispute. Six other young men in Toronto have been killed in Toronto this year. There is now a publication ban on the victim’s name. I have removed it and some of the pictures.